Maren is a senior Sociology major and Peace & Justice minor, originally hailing from Des Moines, Iowa. 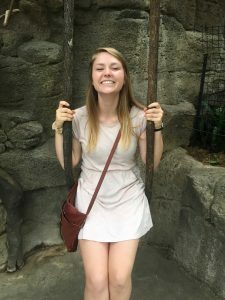 She has been involved in cheerleading, Spiritual Life (retreats, mass ministries, and an internship), the Student Ambassador Program, Dance Marathon, and bringing Art Club to campus. Why did you come to Loras? Everything fell into place with Loras. I was dead-set on not even going to college, but everything worked out too perfectly in order for me to come here. The initial draws were making the cheer squad, the Catholic aspect of Loras, and how many opportunities Loras offered. Out of everything you’ve been involved in, what was the most significant thing you’ve been involved in? Art club, for sure! When I came here, I wanted to pursue an art minor but after my freshman year they took away the program. I felt a little tug on my heart to start the club, so I did. I could not have done it by myself, though. I am so lucky to work with some of my best friends while building the club (Ruth Berning and Erin Cain). It was kind of frustrating to get it started initially, but our adviser (Tricia Borelli) and professors (especially Dr. Waldmeir) have been so helpful. We’ve been able to collaborate with different clubs, hold numerous open studios in our new studio space in the Vis and even paint a mural in the Duhawk lounge. The relationships I’ve formed through the club have been the most rewarding part. Some of my best friends have formed through this club. Some of my best college memories are traveling with my friends. I have gone on three service trips and formed lasting friendships on each one. The trips are so special because the bond is bigger than common interests—we are all working to serve the area we are in, and growing so much as individuals, as well as growing as a group. We then bring the group dynamic back to Loras, thus strengthening the already awesome community. Being able to meet some awesome people through these trips has definitely influenced me to incorporate service and working with people into a future career. I was also able to spend a J-Term studying abroad in Prague. Not only was this trip tons of fun, we got to learn about the culture and history of a place I might not have had to opportunity to go to otherwise. These trips are some of my most treasured memories from college. Also—playing cards in the pub almost every day is a close second for favorite memory! What’s the current game plan for next year and beyond? I plan on working another summer at the camp I grew up going to, then doing a year of service with the Jesuit Volunteer Corps in Montana. After that I would love to either work in youth ministry or pursue a masters in sociology. How have you seen yourself change over your four years at Loras? I have learned how to be more intentional with everything I do. Through my classes and opportunities at Loras, I have learned that everything I choose to do makes an impact in some way. I owe Loras for helping be move from being an individual whose main focus was being secure, to becoming someone who is now open different ideas, people, and opportunities. What is some advice you would give to a younger student who is just starting their Loras journey? I wish someone would have told me to just go to the things you want to go to. Even if no one you know is going—just go. Once you’re doing the things that feed your soul, you’ll meet people with similar ideas and build friendships beyond the classroom or party scene. If you had one word to sum up your Loras experience, what would it be and why? Full. I never felt like I wasn’t able to do something here. Loras does such a good job of playing to our strengths and using them for good. It truly felt like the students are the ones who make the campus come to life, and faculty and staff are always so supportive.